Researchers at Ohio State University discovered a material that can hold both electrons and holes. They hope the material, the layered metal crystal NaSn2As2, could simplify electronics, potentially removing the need for multiple layers or materials. The team didn’t set out to find this; instead, graduate researcher Bin He was measuring the properties of NaSn2As2 when he noticed that the material behaved sometimes like an electron-holder and sometimes like a hole-holder. Repeated measurements showed the same result. Researchers at the National Institute of Standards and Technology (NIST) developed a nanowire ultraviolet LED that produces five times higher light intensity than previous versions. The LEDs are based on gallium nitride (GaN) nanowires. The core of the nanowire is made of silicon-doped GaN, which has extra electrons, surrounded by shells made of magnesium-doped GaN, which has a surplus of holes. Additionally, a tiny bit of aluminum is added to the shell layer, which reduces losses from electron overflow and light reabsorption. The brighter LEDs are fabricated from nanowires with a “p-i-n” structure, a tri-layer design that injects electrons and holes into the nanowire. Adding aluminum to the shell helped confine electrons to the nanowire core, which resulted in a fivefold increase in electroluminescence. “The role of the aluminum is to introduce an asymmetry in the electrical current that prevents electrons from flowing into the shell layer, which would reduce efficiency, and instead confines electrons and holes to the nanowire core,” said Matt Brubaker of the Quantitative Nanostructure Characterization Group at NIST. The nanowire test structures were about 440nm long with a shell thickness of about 40nm. The final LEDs, including the shells, were almost 10 times larger. Researchers found that the amount of aluminum incorporated into fabricated structures depends on nanowire diameter. UV LEDs find applications in polymer curing, water purification, and medical disinfection, and NIST is experimenting with nanowire-based LEDs for scanning-probe tips intended for electronics and biology applications. At least two companies are developing micro-LEDs based on nanowires, according to NIST group leader Kris Bertness, and NIST has a Cooperative Research and Development Agreement with one of them to develop dopant and structural characterization methods. The researchers have had preliminary discussions with scanning-probe companies about using NIST LEDs in their probe tips, and NIST plans to demonstrate prototype LED tools soon. 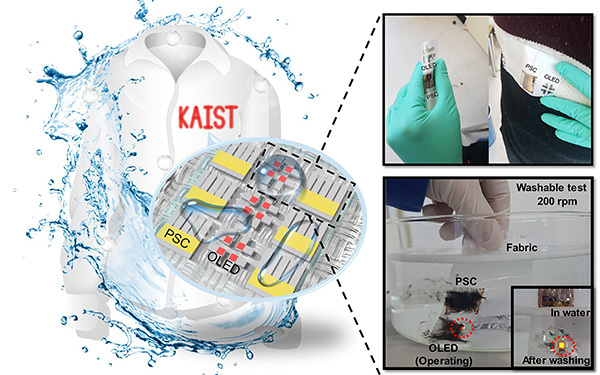 Researchers at the Korea Advanced Institute of Science and Technology (KAIST) developed a textile-based wearable display module technology that is washable and does not require an external power source. The textile integrates polymer solar cells (PSCs) with organic light emitting diodes (OLEDs). To prevent both components from damage, an encapsulation barrier is used to protect them from external moisture and oxygen. While suitable for normal environments, the conventional encapsulation barrier loses its characteristics if exposed to water. The team’s new barrier uses a SiO2–polymer composite capping layer applied through ALD and spin coating. During tests, the display module exhibited little change in characteristics after 20 washings with 10-minute cycles. The encapsulated device operated stably with a low curvature radius of 3mm and high reliability. After 30 days of repeated bending and washing, the device showed no deterioration. By using a textile substrate rather than plastic and utilizing a solar cell that can self-power the device, the team hopes their demonstration will speed up the commercialization of wearable displays.